The U.S. has experienced a dramatic increase in births to unmarried women in recent decades—from 4% of births in 1950, with most of the babies then adopted, to more than 30% today. 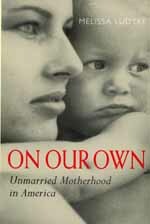 Melissa Ludtke's book is the only in-depth analysis of this radical change in family formation to compare and contrast the lives of these mothers of varying ages and economic circumstances. Melissa Ludtke is a journalist. While researching and writing On Our Own she had fellowships at Harvard, Radcliffe, and the Columbia School of Journalism.